This lavish volume charts the rich history of the blues through the dazzling array of posters, album covers, and advertisements that have shaped the genre’s identity over the past hundred years. The blues have been one of the most ubiquitous but diverse elements of American popular music, and the visual art this unique sound has generated has been just as varied and dynamic. 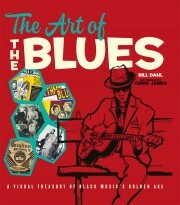 With its incisive commentary from veteran music journalist and blues historian Bill Dahl and its rich imagery — 78 rpm labels, album covers, posters, flyers, and more (over 350 lavishly reproduced images) — The Art of the Blues brings the history of the blues musically and visually to life as never before.